Extremely difficult drive into a deep valley beyond the marker post which also slopes left to right. Even a well struck shot may roll away to the right rough or bounce off the hump to the trees. Steep approach to the green, no bunkers but a steep slope to the right. Balls will collect down to the green from the left. 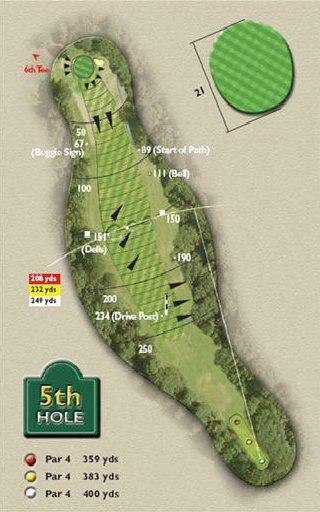 Make sure you tee shot is at the marker post of left of it to have your best chance of keeping the ball on the fairway. From here it straight up! The green is narrow so your best chance of hitting it is by keeping the ball on the left hand side.